Renowned American filmmaker Nicholas Ray’s best movie, and one of the most definitive films in the distinctly American genre of film noir, this gritty psychological drama is as bleak and grim as a windy night in the deserts of Siberia. The stark black and white cinematography even more emphasizes the fatalism and man’s inherent distrust espoused by this classic. The philosophy that society judges a man by how he acts rather than what he actually is, in fact, in many ways borrowed from and a tribute to the existentialist French author Albert Camus’ most celebrated work – The Outsider (in both cases the society judges the respective protagonist a criminal because he hasn’t shown remorse or grief at an incident which is supposed to induce sorrow and tears). Even at the risk of earning the wrath of film viewers, I would say that this is undoubtedly Humphrey Bogart’s greatest work. 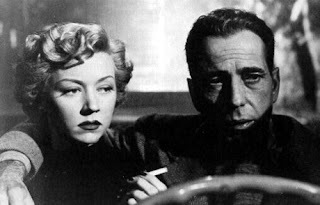 The suppressed violence, rage, unpredictability and cynicism is unmatched even by Bogart’s lofty standards. Getting through this incredible movie would assure that words like happiness would vaporize out of one’s vocabulary for quite some time. Watching this film gave me a tremendous high nonetheless.